A teenager has unknowingly unearthed never-before-seen photos of Nirvana’s very first gig and tweeted them. Maggie Poukkula’s father Tony put on a show in his Washington basement in the spring of 1987 and played two Led Zeppelin tracks with the band, including Kurt Cobain, Krist Novoselic and Aaron Burckhard. 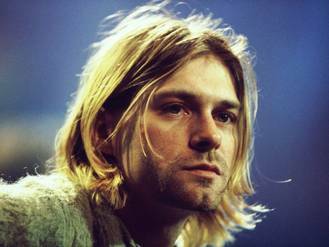 The 19-year-old stumbled across the three snaps while flicking through her dad’s Nirvana biographies but had “no idea” of the significance of them. Prince's new album features "so many hits". The 57-year-old musician has completed his 38th studio LP, which will be titled 'The Hit & Run Album'. James Morrison is making a comeback. The 30-year-old singer/songwriter is set to relaunch his career. Noel Gallagher believes rock 'n' roll is "in hibernation". Bob Dylan may be revered as a poet for his songwriting ability, but Eminem and Kanye West have both been found to use a wider vocabulary than the folk legend. The nominations for the 2015 MTV Video Music Awards have been announced and some of the stars have taken to Twitter to express their gratitude and excitement. Dappy has penned "three massive N-Dubz comeback songs". Hard rocker Meat Loaf has announced a tour for the first time in two years after health concerns clouded over past shows. Dave Grohl brings his doctor on stage to sing 'Seven Nation Army' during Foo Fighters gig. One Direction star Niall Horan and Justin Bieber sent fans into frenzy after pictures surfaced of the two singers having fun together.